Have you ever considered locking specific files on your computer to prevent accidental deletion? It’s actually very easy, and doing so can save you from the frustration of attempting to recover important data where you may not be successful. While it’s true that a good recovery application such as Recuva, can often recover accidentally deleted files, it’s important to know – recovery is not always possible. Immediate action, following deletion, is the key to recovery. When I talk about accidentally deleted files, I often recall the story of a friend whose teenagers had deleted all of the family photos to make room on the Hard Drive, so that they could download a peer to peer movie. Unlike most home computer users I come into contact with, he happened to be one of the few who had followed my advice that all important data on the family computer needed to be backed up regularly. While he was still disturbed that the photo files had been erased, this incident wasn’t the disaster it could have been. It’s obvious that having a backup plan (a disaster recovery plan), in case you lose irreplaceable data, is critically important, but there is a way to prevent accidental file deletion. 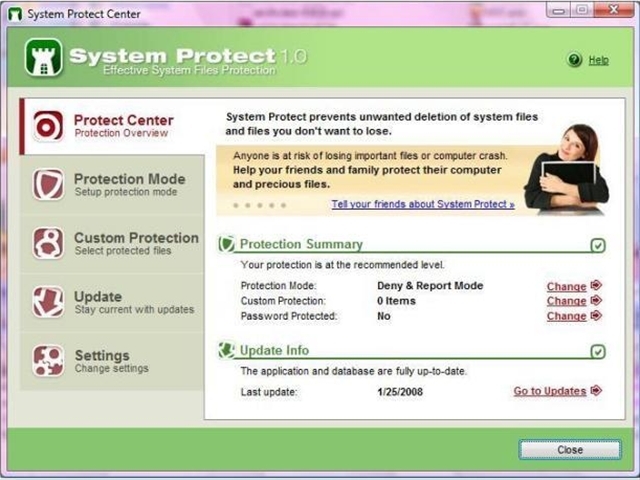 System Protect is a free, easy-to-use application from Crawler (the people who gave us Spyware Terminator), that helps protect important programs, documents and files, from deletion caused by viruses, other users on your computer, or your own mistakes. Since mistakes are inevitable on a computer, this neat little program could be just the thing you need to reduce the chances of having to deal with that unrecoverable error.